In comparison to the number of Lance and Pershing missiles and launchers, the 155-mm and 8-inch howitzers are undeniably the backbone of US Army Field Artillery fire support team. Any threat to the ongoing modernization of AFAPs for these two howitzers should be a matter of great interest and concern to all artillerymen, whether cannoneers or missileers. 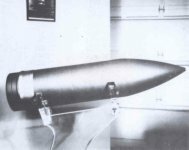 The M442 8-inch artillery projectile was a major advance in technology because its W33 warhead was packaged for easier handling and transport. The deficiencies of the 8-inch warhead were well known by US artillerymen. The W33 entered the inventory in the mid-1950s and was designed with the technology of the 1950s. Its complicated field assembly, range limitations, and relatively imprecise mechanical time fuzing would all be corrected by a new projectile and warhead. This warhead delivered a 10-KT burst at ranges up to 18 kilometers. Many Field Artillerymen could remember long hours spent in the back of M109 vans or in bunkers at lonely warhead detachments performing technical operations on nuclear rounds, including the M442, during Army training and evaluation programs (ARTEPs) or nuclear surety inspections (NSIs). The M442 projectile was still in use when the Army received "End of Mission." By 1980, the new 8-inch AFAP, incorporating the W79 nuclear warhead, was designed to replace the current W33 warhead, presently deployed with US and NATO units. The W79 warhead was in Production Engineering at the Department of Energy (DOE) (formerly ERDA and, before that, AEC) laboratories. In total, since 1957, some 2000 W33 warheads were manufactured, which were in service until 1992. The W33 was tested twice: September 8, 1957 in the series of tests Operation Plumbbob Laplace (power 1.22 kt). Operation PLUMBBOB, the sixth series of atmospheric nuclear tests conducted within the continental United States, consisted of 24 nuclear detonations and 6 safety tests. The PLUMBBOB series lasted from May 28 to October 22, 1957, and involved about 14,000 Department of Defense (DOD) personnel, mostly military service personnel, participating in observer programs, tactical maneuvers, and scientific and diagnostic studies. Shot LAPLACE was conducted at 0600 hours Pacific Daylight Time on S September 1957. The device was suspended from a balloon and fired 750 feet above the ground in Area 7 of the Nevada Test Site. The top of the cloud resulting from the detonation reached a height of 20,000 feet. Two technical service projects were conducted at Shot LAPLACE: 50.3, Evaluation of Medium Range Detonation-detection and Cloud Tracking Systems, and 50.8, Detection of Atomic Hurst and Radioactive Fallout. Project 50.3, Evaluation of Medium Range Detonationdetection and Cloud Tracking Systems, was fielded bv a detachment from the Army Signal Research and Development Laboratories, Fort Monmouth, New Jersey; personnel from Fort Meade, Maryland; and personnel from Fort Huachuca, Arizona. The project had two purposes: to test the capacity of Army radar equipment in detecting the nuclear detonation and tracking the radioactive cloud, and to examine Army fallout prediction methods. Project 50.8, Detection of Atomic Burst and Radioactive Fallout, was conducted by the Army Air Defense Board, supported by the 495th Antiaircraft Missile Battalion. The project, which involved an estimated 105 DOD personnel, was designed to determine how well equipment found in a tvpical Army unit could: Determine the location, height of burst, and yield of a nuclear detonation; and track targets and guided missiles through a radioactive cloud or fireball. The second test was May 12, 1962 - Operation Nougat Aardvark (power 40 kt), was detonated at a depth of 1424 feet. The NOUGAT underground tests conducted at the Nevada Test Site (NTS), during the period 15 September 1961 through 30 June 1962. According to one official report, "The successful test provided information useful in the design". The device was described as having a diameter of 8 inches, a length of 27 inches, and weight of 200 pounds. Not once was the W33 tested by a shot from a real gun. In the Laplace Plumbob test, the charge was raised on an aerostat to a height of 225 m. In the Nougat Aardvark test, the explosion was underground.